Made of 30% cotton and 70% polyester, super cozy and warm. Super soft and cozy fabric, Feel like Cashmere and warm,has a subtle sheen. especially perfect for a chilly outdoor night. This Black Pashmina is perfect as a gift on birthday or Christmas. Black pashmina shawls and wraps may be wear as bridesmaids shawl or dress stole. This large and long wrap scarf will dress up any outfit for a formal occasion or simply use as a summer evening wrap. Great as a shawl, head wrap, hijab, stole or light scarves for women. Wrap this pashmina around your shoulder will warm you body in a evening night. 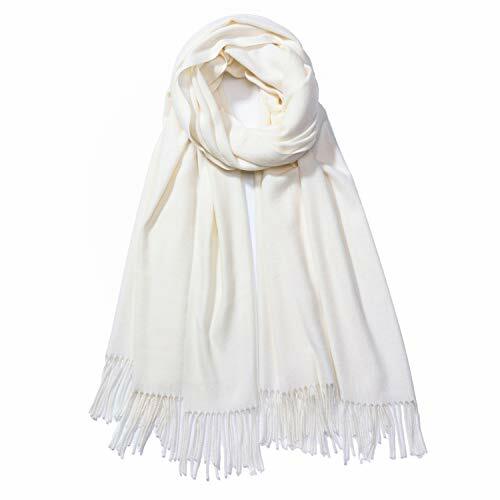 And this cashmere scarf pashminas will dress up any outfit in any occasion. Such as: warm shawls and wraps for evening dresses or wedding warm shawl. When got dirty, please gently hand wash below 30℃ with a neutral detergent, do no dry clean, do not bleach. There may be slight dimension error due to manual measurement. The color may be a little difference compare the image with actual item due to monitor reflect, please understanding, thanks! 100% MONEY BACK GUARANTEE - QIFANDI ensures all our customers with 100% Money Back Guarantee and Lifetime Breakage Warranty for our product. In case of any broken issues, please contact us without hesitation. We will provide the best service until our customers are satisfied. You have no risk to try! If you have any questions about this product by QIFANDI, contact us by completing and submitting the form below. If you are looking for a specif part number, please include it with your message.